JBL OnBeat Rumble Apple Lightning dock joins OnBeat Micro, plus JBL Charge wireless speaker | What Hi-Fi? We've just had a tour of the Harman/JBL stand here at CES 2013, and in addition to the products mentioned below, we spotted a couple more interesting new items. There's a new version of the Harman Kardon Play + Go portable music system on the way, this time with Bluetooth wireless streaming, and available in black or white. And Harman also has a trio of new soundbars in the pipeline, the SD100, SD200 and SD400, the latter with a wireless subwoofer. JBL has announced the OnBeat Rumble Apple Lightning speaker dock, joining the JBL OnBeat Micro as the world's first Apple Lightning docks. The OnBeat Rumble is a wireless Bluetooth speaker, too, and launches alongside the JBL Charge, a simpler wireless Bluetooth speaker without a dock. The new JBL speakers will be launched at CES 2013, which kicks off on Monday next week, though plenty of news is already leaking out. 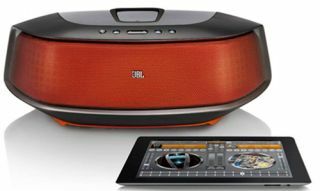 The JBL OnBeat Rumble wireless speaker works with any smartphone, tablet or computer with Bluetooth on board. It will also charge the latest generation of Apple products that use the Lightning connector via the dock. So that's the latest iPhone 5, iPad mini, iPad 4, iPod touch and iPod nano. The OnBeat Rumble also uses JBL's proprietary Slipstream port technology, promising 'pounding bass with low distortion' amongst other sonic claims. If you're after something a little more portable, there's the new JBL Charge. Also new for CES 2013, it's a Bluetooth wireless speaker with the added bonus of a USB slot for connecting and charging phones and tablets. The JBL OnBeat Micro Lightning dock will also be on show at CES, though we've already given it the hands-on review treatment. You can also read our exclusive review of the first Apple Lightning dock we've reviewed, the JBL OnBeat Venue LT.
We're off to CES over the weekend to cover the show in full next week, so expect more wireless speakers and Apple iPod docks, alongside myriad TVs, tablets, hi-fi products, home cinema kit and much more besides.